For 40 years, S&B Finishing Co. Inc. has enjoyed success by staying true to the age-old philosophy of treating its clients the way it would want to be treated. This way, President Kenny Spielman says, the firm earns customer loyalty. S&B has been family owned and operated since 1977. We value our more than 50 highly trained employees, who we consider family. Some have been with S&B for more than 30 years, and our average employee tenure is 12½ years. Based in Chicago, S&B specializes in powder coating, liquid coating and multistep coating services that protect and preserve metal parts. Spielman cofounded the firm with his father, Ralph Spielman, in 1977. However, the involvement of the Spielman family in the industry goes back to the 1930s, when they produced paints and chemical coatings under the name Capital Chemical, which they sold in the 1970s. Shortly afterward, when his father wanted to go back to work, Spielman purchased a finishing line from a lamp company, modified it to full automation, and started S&B. A decade later, the company moved to its current Chicago location. A staff of 50 works in S&B’s 35,000-square-foot facility, where the company coats products for Caterpillar, Ford Motor Co., Freightliner, General Motors, John Deere and many more. Additionally, S&B offers specific custom brands and finishes, including DuPont, The Sherwin-Williams Co. and TIGER Drylac U.S.A. Inc. “We try to meet the customer’s needs,” Spielman says. We are the leading Chicagoland powder coating service that can meet specific corporate standards, and we have experience coating parts for Caterpillar, Ford, Freightliner, GE, General Motors, John Deere and other large manufacturing companies. In addition to stock coatings, we offer specific custom brands and finishes, such as Axalta Coatings, AmeriCoats, Rohm and Haas, Sherwin-Williams, and Tiger Drylac, to meet your needs in a quick and convenient manner. Powder coating creates a hard finish and a very uniform look to parts. Different types of powder coats, such as epoxy coating, hybrids, urethanes, aliphatic urethanes, TGIC polyesters, fusion-bonded epoxies and functional coatings, have different looks and protection abilities. S&B Finishing also provides electrostatically applied liquid coatings, such as baked enamel, polyurethane and all types of resistant coatings that are corrosion resistant. 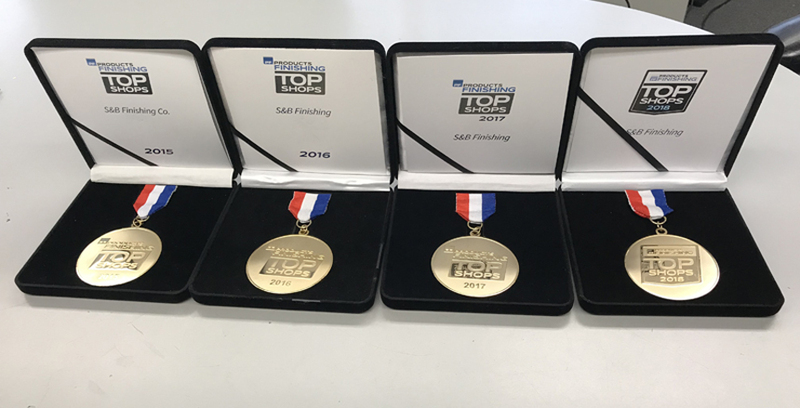 We are proud to announce that S&B Finishing has been named one of “The Best of the Best for 2018” by Products Finishing Magazine, a trade publication which has covered the powder coating industry since 1938. This is the fourth consecutive year that S&B has been on this prestigious Top Shops list. Products Finishing recognizes the best shops in the liquid and powder coating industries. S&B Finishing is a proud member of top industry organizations, including the Powder Coating Institute (PCI) , American Society for Testing and Materials (ASTM) International , and Chemical Coaters Association International (CCAI). We are also an Axalta Coatings (formerly DuPont) Star Coater, an exclusive group of about 40 powder coating companies across the United States. We are proud to be an ISO 9001:2015 registered company. S&B Finishing provides high-quality powder coating, liquid coating and multi-step coating services that protect, preserve and beautify metal parts. S&B Finishing will apply only the finest industrial powder coatings, liquid coatings, and protective coatings with expert craftmanship!